Here presents various types of work breakdown structure diagrams. Free download and customize your own styles WBS diagrams in minutes with Edraw powerful diagramming software. Work breakdown structure (or WBS) diagram is a hierarchical tree structure which break down the project into activities and then tasks. It makes a big project more intuitive by seperating a complex and multi-step project into more manageable portions. With Edraw, you can create a WBS by using built-in templates for reference or design with powerful tool-sets. 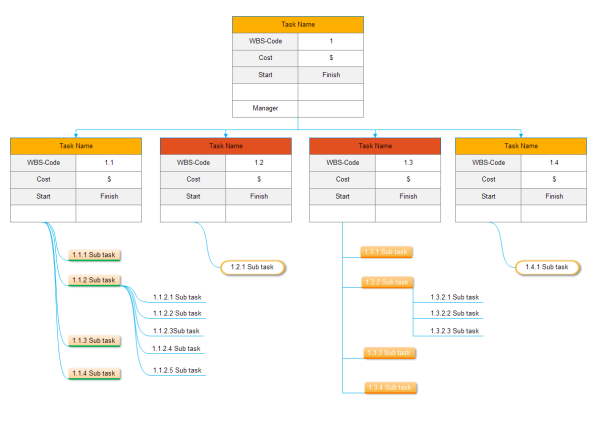 Today I am going to show you some designable templates to better understanding of WBS diagrams. 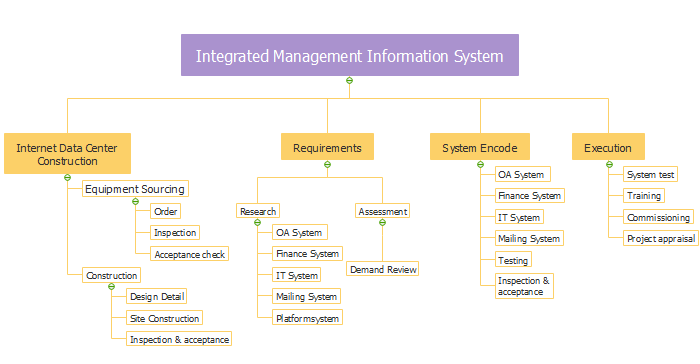 Below is a WBS template for system construction. It is a classic and traditional style of WBS structure with straight lines and square shape text box in hierarchical tree structure. 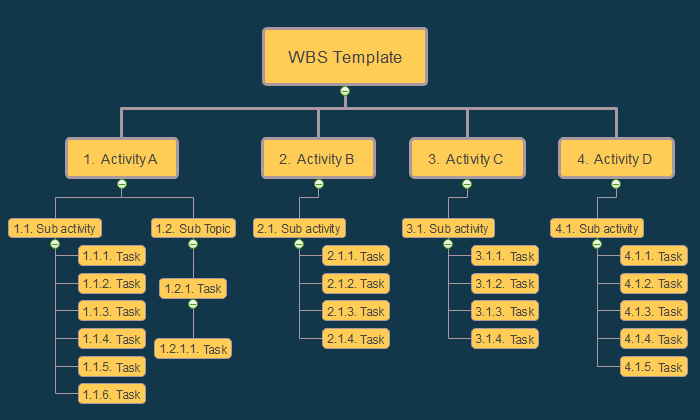 This template is more detailed than previous classic WBS structure as it offers users a task charts with clearer information. You can manage the starting time, finishing time, cost and project code easily. It is proper for a large project. Total custom shapes version of work breakdown structure diagram is more like a tree. if the project is large, it will be a luxuriant tall tree which has several branches of seperate components. Download the template by clicking it. The laconic version of work breakdown structure contains unlimited activities and all of them are broken down to smaller tasks for project control. You can download the template to begin your project work breakdown structure diagram without any drawing skills. How to Create Work Breakdown Structure Diagram?